I have been involved with aquariums for the past 22 years, and, like many others involved in this hobby, I started with a freshwater tank. As I grew older, my appetite for a larger tank kept increasing, and by the time I was in college, my roommate and I were trying our hands at Betta fish breeding. We were actually successful, I might add, until the end of the semester stopped our progress. During this freshwater venture, I also cared for many types of fish ranging from the gentler kinds, such as Tetras, to the villains, such as Piranhas. When I finally got a job after college, I wanted to try my hand at saltwater, and I set up a 29 gallon fish-only tank. After a few years, I had to tear it down due to traveling constraints, but a friend got me involved in the hobby again about 11 years ago. Since that time, I have graduated up the scale from fish-only, to fish-only with live rock, and then to the full changeover to a reef environment within the last couple of years. I had a full reef setup in a 29 gallon tank for over a year, until it was time to upgrade to what I have today; the 75 gallon reef seen above. I am very passionate about this hobby and attempt to take care of the animals in my charge. 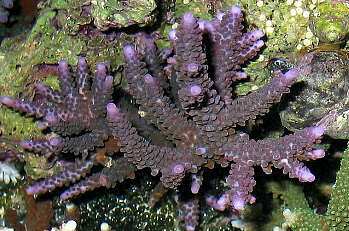 I may not know every name of every coral, but I do know how to take care of them and, hopefully, how to make them thrive. I hope you enjoy my tank as much as I do, if that is at all possible. 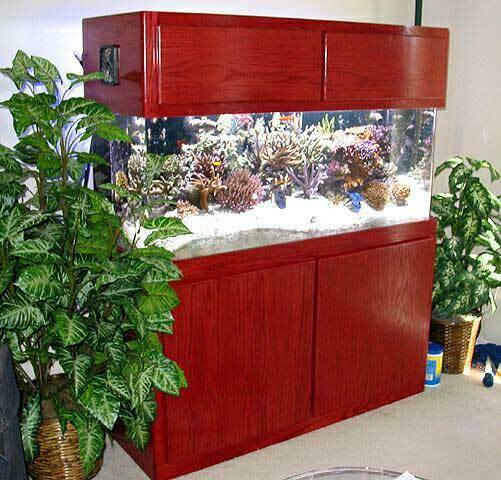 The tank is a standard size acrylic 75 gallon, made by a local Seattle area company called Innovative Aquarium Products (IAP). The top opening was built as large as possible, so that my short arms can reach anywhere within the tank. The picture below gives you an idea of the extent of the opening. The tank's dimensions are 48" x 18" x 20." Natural Woodcrafters of Portland, Oregon specifically built the stand and canopy with a reef tank in mind. The back panels of each were made to be open so that heat can easily escape from the sump and the lighting area. Both the canopy and stand were designed to have 4" fans installed on either end for cooling. 2 ½" lip all the way around to provide greater access inside. Equipment that not only works well, but which is also highly reliable, means a lot to me. I tend to travel for business every once in a while, and when I do, I want to make the tank as maintenance-free as possible. Besides, when I am home I like to enjoy the beauty of the tank instead of always working on it, and it is for these reasons that the tank is highly automated. The design features all demonstrate the automation I have built in; such as the automated top-off water system, the use of a computer controlled system for lights, heater, and fans, and the use of a calcium reactor to maintain calcium and alkalinity levels. 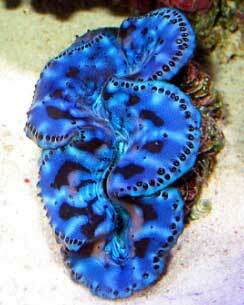 Since my goal is to have a light-loving SPS and clam-dominated tank, lighting is an important consideration. I experimented with many different lighting schemes until finally settling on the system I have today, which seems to suit not only the coral inhabitants, but also my sense of aesthetics. 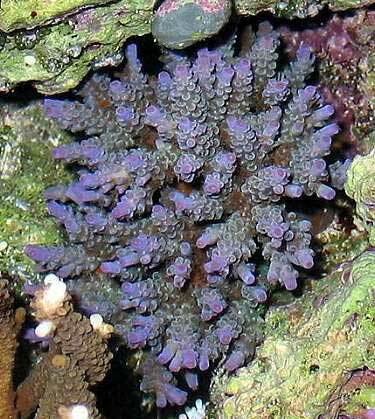 Tremendous growth and great coloration on my SPS corals have been the end result. The canopy is 12" high, has two removable doors in the front that swing open, and the whole top lifts upward. The lighting consists of two 250 watt metal halide 10000K bulbs, fired off of a dual PFO HQI ballast. One bulb is a double-ended Aqualine Buschke in a pendant, and the other is a mogul based Aqualine Buschke. The metal halides are supplemented with 330 watts of URI VHO actinics powered by an Icecap 660 ballast. Two Toyo fans, both rated at 112 cfm, cool the canopy. These are relatively quiet fans, and I highly recommend the Toyo fan for anyone wanting a quiet canopy cooling system. One fan is engaged when the lighting is on, while the other is only powered if the tank temperature creeps too high (>83º F). This function is controlled by the Aquacontroller, which is programmed to turn the specific fans on or off based on the tank temperature provided by the temperature probe located in the sump. 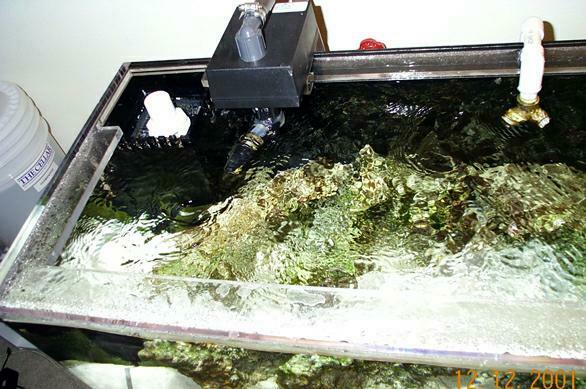 The tank is filtered by a 4 to 6 inch deep sand bed, which utilizes pure aragonite sand from PureAragonite.com. 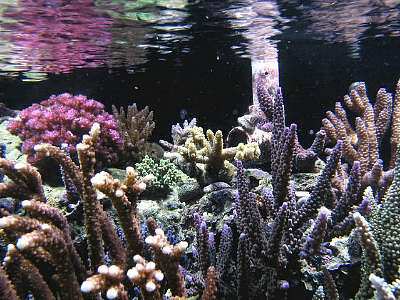 In addition to the sand bed, about 120 lbs of live rock, consisting of Fiji, Manano, and Marshall Island, is used. 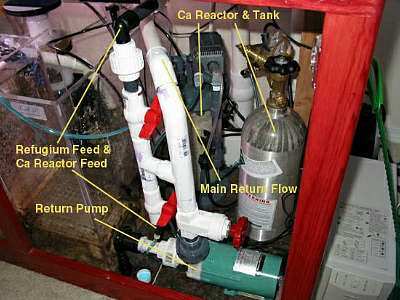 There is normally no mechanical filter or media in this setup (except for the occasional use of carbon in the sump). A 40 gallon custom-made sump provides additional water capacity, as well as a place to locate my protein skimmer. The sump was co-designed by Shadetree from Reef Central and myself, and was manufactured by IAP here in the Seattle area (same manufacturer as my tank). 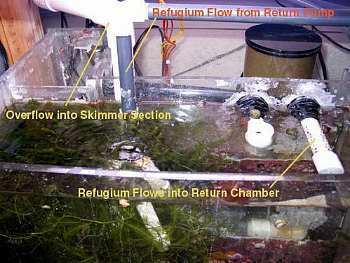 The sump contains a separate section serving as a refugium, and is fed via a 'tee' from the return pump placed inline before the flow returns back to the main tank. 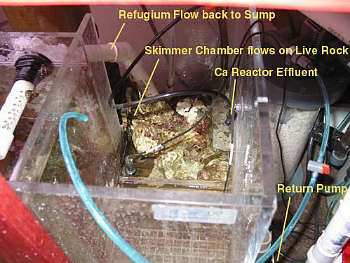 The output of the refugium flows over a pile of live rock in the last section of my sump prior to flowing through a series of baffles that lead to the main return pump. 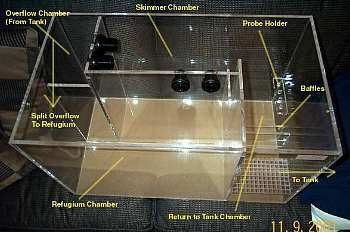 The sump houses an AquaC EV-120 protein skimmer. The main circulation pump is an Iwaki MD-30RLT, and a Mag 5 powers the skimmer. I also have two 4" Toyo fans rated at 76 cfm installed in the sump area within the stand. Both only turn on when tank temperature rises too high (~82º F). 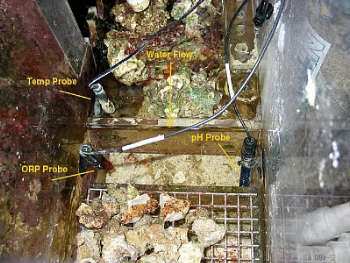 Since the flow is relatively low through the sump (about 400 gph), a closed-loop system is employed to supplement circulation within the main tank. The closed-loop pump retrieves water from a 1.5" drilled bulkhead with a strainer to keep out large particles or inhabitants. An Ampmaster 2700 pump is used, and approximately 1800 gph circulates through the closed-loop system. The pump is connected to 1.5" PVC and runs to a common manifold, which feeds two 3/4" SeaSwirls (see below). Total turnover rate for the tank, including the return pump and the closed-loop pump, is approximately 29 times the volume of the main display tank. 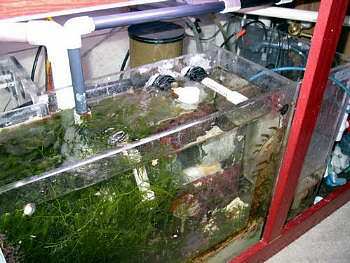 To keep dissolved nutrients low, an oversized skimmer is used; adding a refugium allows more nutrients to be exported through macroalgae uptake and harvest. Of course, the refugium is also used to cultivate small crustaceans and worms in a semi-predator free location, and this helps to supplement feeding to a Green Spotted Mandarin (which, by the way, also eats frozen brine shrimp). Two 30 watt 50/50 URI VHO bulbs, driven by a PFO ballast, light the refugium. The refugium lighting remains on approximately 4 hours after the rest of the lighting has been switched off to help maintain pH levels in the tank (due to the macroalgae utilizing excess CO2 with the tank lights on). As a side note, I have a pair of Gold Striped Maroon Clownfish inhabiting the refugium, as well as a number of Blue Linckia starfish that are housed there, prior to being fed to the Harlequin shrimp. The reader may have noticed that this refugium has some fish inhabitants, and it is for this reason that I have called it a semi-predator free environment. 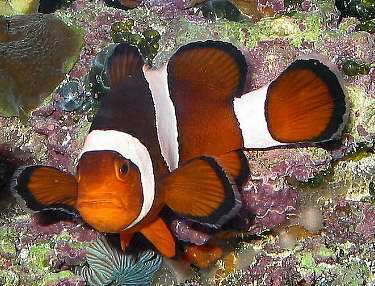 Based on the fact that I have seen these clownfish on many occasions take an amphipod into their mouths, only to spit them out, I think this is a fair assumption. It should also be noted that this only occurred when a live amphipod was floating by in the water column. 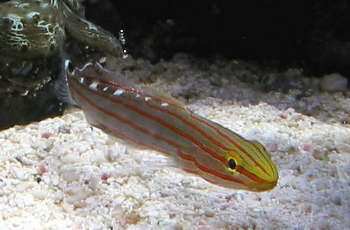 They do not go searching for amphipods to eat; I just don't see that with these two fish. Since infrequent chores were part of my goal with this tank, a calcium reactor is used to keep alkalinity and calcium levels within acceptable levels. A Korallin C1502 calcium reactor filled with CaribSea ARM or Korallith media is setup under the stand. Originally, it was finicky to get adjusted, but I believe it is now well dialed-in. I have learned a few lessons with this reactor. One of the most important considerations is to provide a consistent water feed, so the reactor is fed via the main return pump from the sump. The reactor works very well at maintaining the calcium level at around 425 ppm and the alkalinity around 11 dKH. Given the fact that I wanted to automate the system as much as possible, and the fact that the system evaporates at least 1 1/2 gallons of water a day, some sort of auto top-off device was needed. Since the tank is located in the living area, I did not want any ugly buckets or containers to hold the top-off water. Also, I did not want much maintenance on the top-off system itself, and it is for these reasons that a NURCE unit was chosen. The Model A, which has a capacity of about 6.4 gallons, is filled with reverse osmosis water as the filtered water source, and the container is refilled at least twice a week. It is completely siphon fed, so there are no pumps to worry about, no float valves or float switches, and nothing electrical to plug in. This was a great investment, and future plans include upgrading to the 11 gallon version within the next few months. The key to all of the automation of the tank is the use of a Neptune Systems Aquacontroller II. Temperature, pH and ORP probes are all plugged into the Aquacontroller, and with this device, all of the lighting cycles as well as functions based on tank temperature and pH levels, or even ORP levels, can be programmed. The timer function is mainly used for the lighting and one of the canopy fans. This fan is turned on just prior to the first metal halide lamp firing to ensure cooling when the MH lamp is lit. The other functions are based on tank temperature. 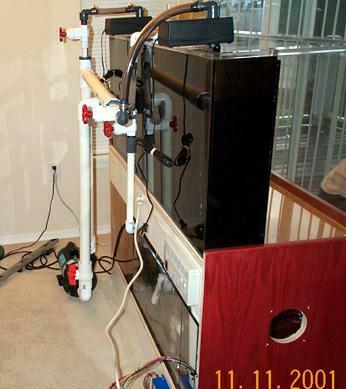 The heater is controlled by the Aquacontroller, as well as the rest of the fans. If the tank becomes too hot, it cycles on the three remaining fans. When the tank temperature finally cools down, the fans are then cycled off. If the fans are not enough to keep the tank cool, and the tank reaches an upper temperature limit, the MH lamps are turned off. This mini-computer is one of the best devices I have purchased for the system. I am not a big advocate of using many of the additives on the market. I feed the tank once a day with frozen Mysis shrimp, frozen brine shrimp, occasional flake feedings, and occasionally add DT's Phytoplankton. Some fish enjoy Formula I, while others prefer just the Mysis shrimp. Overall, they get their fill and continue to grow quite nicely. The corals and clams are fed the DT's phytoplankton once every week, or more, but still show rapid growth, perhaps receiving some food from what I am feeding the tank for the fish. On occasion, I will add Kent Turbo Calcium and Seachem Reef Builder as required to raise any calcium or alkalinity deficiencies, as well as magnesium supplements to aid in maintaining calcium levels. No other additives are introduced except for the dosings from the calcium reactor. Maintenance activities for the tank are generally minimal, since much of the system is highly automated. However, the tank's acrylic front and sides are cleaned twice a week using an acrylic pad, a magnet, or a credit card if scraping is required. The skimmer collection cup is removed and cleaned once every 2 weeks. 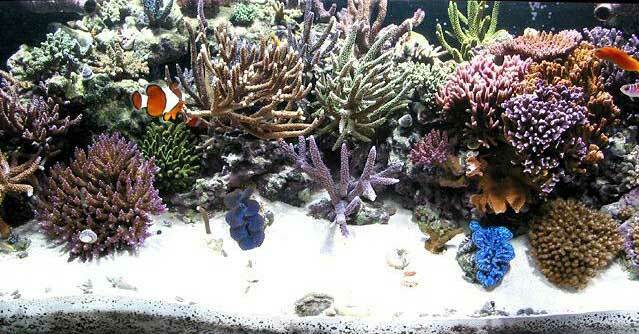 Five to ten percent water changes are performed on a monthly basis. 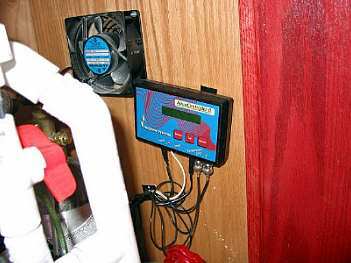 The calcium reactor drip rate is checked daily, and the CO2 tank readings and tank temperature are monitored closely. 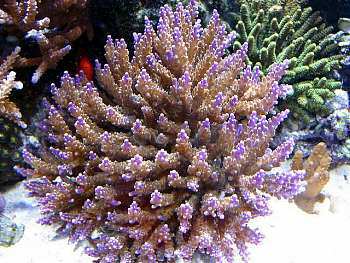 My tank is designed to be a full-blown SPS reef tank, containing many colorful varieties of branching Acropora, as well as Millepora, Montipora, Pocillopora, table tops, and encrusting Porites. 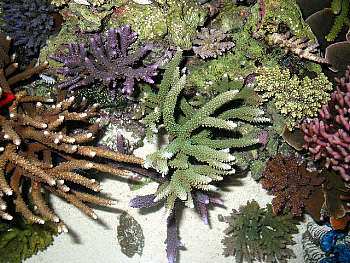 While there are at least 50 different species of SPS in my tightly packed 75 gallon reef, the highly colored branching varieties tend to be my favorites. In my opinion, however, you can't have a complete reef without the fish to go with it. 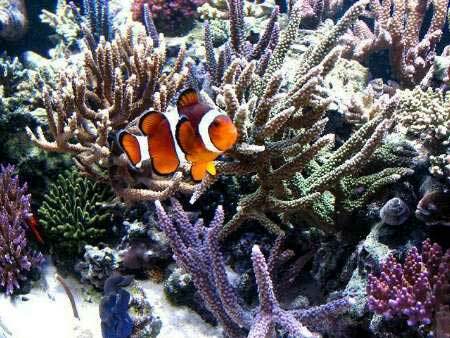 The primary swimming inhabitants of this reef are a pair of Ocellaris clownfish. I have kept this pair for over 10 years now, and they are the 'King' and 'Queen' of the tank. 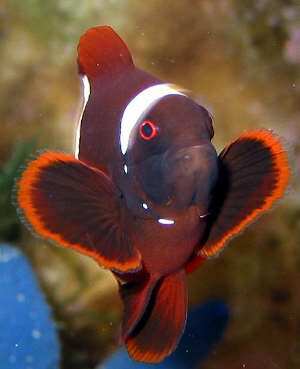 All other fish that are introduced MUST be compatible with these two fish, or they do not go into the tank (hence the reason the Maroon clowns are down in the refugium). 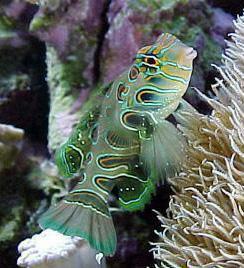 Along with the clownfish, the fish in my tank are a relatively small and peaceful group. 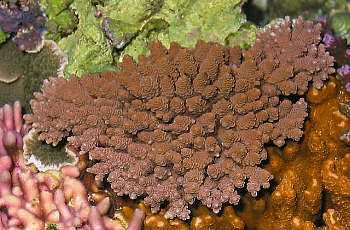 Several clown gobies inhabit the acropora branches, and a Flame angel manages to keep the Chalk basslets in line. 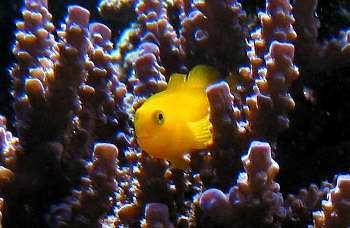 The Midas blenny, which moves in and out of its coral encrusted home, has an endearing personality. 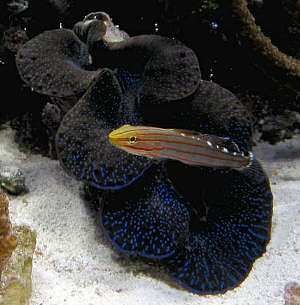 Other inhabitants include small fish such as an Orange-striped goby, a Rainford's goby and a spotted Mandarin dragonet. 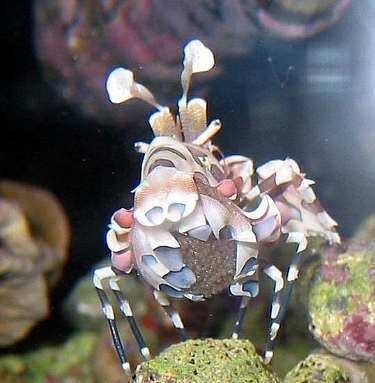 This tank also holds the mated pair of Harlequin shrimp which were the subjects of a slide show in a recent issue of Reefkeeping. It is quite a treat to see the female shrimp carry her young under her belly up until the day of their release. It is a nice compliment to be the tank of the month, and with so many spectacular tanks that have preceded mine, it makes me feel like I have accomplished alot in such a short period of time. I plan on staying in this hobby for quite some time, as it is very rewarding to see such success in trying to provide a little part of the ocean in my living room. If there are any further questions about my tank, my setup, my livestock, or any other off-the-wall questions, please don't hesitate to ask. 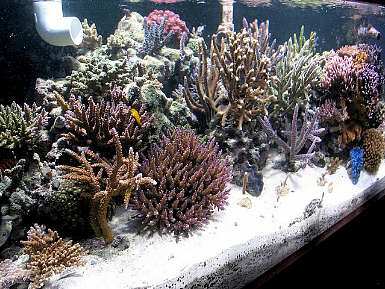 Click the banner below to visit Chuck's website for more information on this outstanding reef tank.